The M Frame has evolved from a replacement for the Blade System to the modern piece of sports equipment we know today. 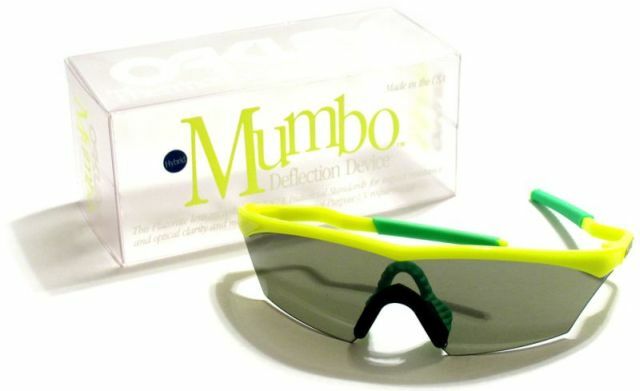 In late 1989, Oakley released the Mumbo as a form of self-competition in order to phase out the Blades, but still keep sales high with the new model. The Mumbo was originally designed with straight stems like the Blades, however just prior to their release, Jim Jannard took the stems and 'hammered' them into the shape they soon became and thus providing the name 'hammer stems'. The patent for the decorative design had already been submitted, so these record show the original design. The straight stem release did remain for the Sub Zero's two years later and for the Baseball specific M Frame models. The three original lens shapes were V, 67 and Hybrid, which was roughly an approximation of the two. In 1990 soon after their initial release, there was a conflict with Mambo clothing over the name, so it was switched to the M Frame while still keeping the term Mumbo on the box in order to lessen confusion over the name change. 1991 brought more lens shapes and further ways to customize the M Frame. The Strip lens appears but soon faded away, while the modern Sweep and Heater lenses joined the lineup. Strike and Slash were promised soon, and presumably appeared in 1992, but were prominent in the 1993 catalog. However by 1993 the Strip, V, and 67 lenses had been removed leaving only the five shapes to last several years later. 1994-1996 brought several changes to the Oakley lineup. Engraving on the lenses of the M Frames were now common, and the second generation of M Frames hit the market. In addition to the patented 'fang' stems, which lengthened the stems past the earsock, the hinge was continued further down the stem, until the hammer portion, in order to provide extra strength. The trademark Icon also appeared replacing the Classic logo. 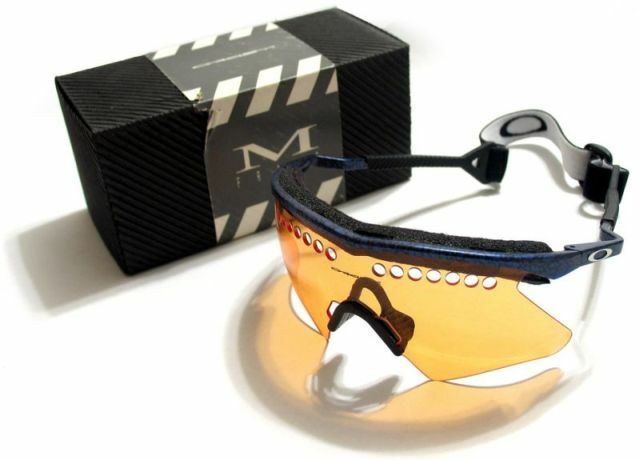 Also in 1996, Oakley released a unique hingeless design for the sports market that was more fluid in nature, using the O Matter's inherent flexibility to grip the wearer's head. The Molded Icon made its final appearance along side the current releases such as the New Zero 0.4. Between 1997 and 1999 the Hybrid lens, which originally was related to the V and 67 both long since gone, was redesigned to be a New Hybrid of the Strike and Heater and thus named so. 1999 brought a line-wide change for many Oakley glasses. Eye Jackets, Straight Jackets, O Frame and M Frame all were redone from the ground up and became the 'New' line (ie: New Eye Jacket). The New M Frame retained the design of the Pro M Frame now with a hinge, but added the true metal icon that other pairs were now adopting. Throughout the first half of the 2000's few additions were made. A smaller Hybrid S lens appeared on certain models, and a 'Golf' lens which was vented also was released. In 2002 when Oakley experimented with Magnesium as a frame material, the Mag M Frame entered production with its own proprietary lenses, but still using the same outer shape. In 2005 the traditional M Frame was altered slightly by adding a lens clip to prevent the lenses from being jarred downward and out of the frame. These were sold as an array with a vault and Grey/Clear lenses. The Ballistic M Frame was a government/military-only release. In 2006 after making a brief appearance during the previous Tour de France by Lance Armstrong, a version 2.0 of the Ballistic M Frame was released based on the Thump Design. Originally labeled the High Performance M Frame by the community, it appeared for Military-only sales. In 2007 the potential successor to the M Frame was released labeled the Radar. In an attempt to renew the sports line which hadn't been touched since the 2002 Half Jacket, the Radar appeared along side the Flak Jacket. The hammer stems remained, but a jet intake along the temple was added and the nosebridge was permanently fixed to the frame in order to keep the lens in place, but possibly adding the potential of the piece breaking. Before the release the Radar was listed with the current M Frame lenses: Heater, Hybrid and Strike. Once the new lens names were applied, the original SKU's mapped the Heater to Range, Strike to Pitch and Hybrid to Path. However when pictures for the lens shapes were released, Path was more like Strike and Pitch like Hybrid. The names were apparently changed in order to prevent lens swapping. Shortly after, the Baseball specific model was released as the Radar Straight Stem accompanying a similar women specific model. My first M FRAME MUMBO this coming, I'm guessing. Thanks. I should have another article soon. We look forward to more articles ..
No problem. I will be adding to it over time as well. Thanks for this Dann. The M frames for me were the first pair I wanted from Oakley. M Frame was my first Oakley around 25 yrs ago, very expensive for me at the time. Great info Dann I am learning lots on here, thanks.